Rue La La has their free $10 credit deal back up. It’s been about three months since they’ve done a free credit promo! And they’re once again offering new members a free $10 credit just for signing up for Rue La La (no purchase necessary, but you do need to be a new member!). The credit will appear in your friends account within 48 hours and then they just need to use it by September 30, 2012. 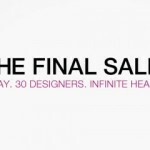 Deal ends August 31, 2012. 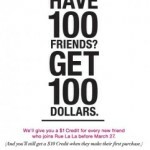 Remember, you need an invitation code to shop at Rue La La, and you still get a $10 credit for each friend that makes a purchase.